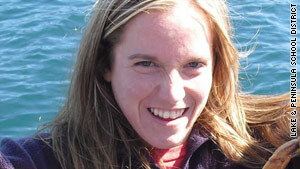 Candice Berner, 32, was killed by wolves while jogging near Chignik Lake, Alaska, last week. Tenino, Washington (CNN) -- Authorities in Alaska are examining two wolves to see if they are the animals that killed a jogger last week, said a wildlife biologist investigating the attack. The two gray wolves were tracked down Monday and shot to death from a helicopter near the town of Chignik Lake, Alaska, said wildlife biologist Lem Butler. The wolves are suspected of killing special-education teacher Candice Berner last week. Berner, 32, was attacked while jogging near the town, authorities said. "We had a systematic search," he said. "These were the only two wolves we could find tracks for." The wolves appeared to be the same ones that left tracks at the scene of the attack, and they matched witnesses' descriptions of the animals seen near Berner's body, Butler said. Officials will conduct tests on the wolves' carcasses to determine whether they killed Berner, Butler said. The carcasses will also be examined to see whether the animals were rabid or starving, or suffering from some condition that led them to attack a human, he said. The rare wolf attack shook Chignik Lake, population 105. "We see wolves a lot," said Johnny Lind, president of the Village Council. "But we've never had anything like this happen." The killing is thought to be only the second fatal wolf attack in North America in more than a century. In 2005, a wolf pack killed a geology student in Saskatchewan, Canada. Wolves typically avoid human contact and do not threaten people, said John Blankenship, executive director of Wolf Haven. "They are not human predators. It's healthy to have awareness of them, for sure. But to be afraid of them is too strong an emotion," he said. Wolf Haven in Tenino educates the public about wolves and serves as a haven for about 50 rescued wolves, many of them once kept as pets.